I’m in south Delhi, walking up a single-lane road that’s roaring with rickshaws (“Missee? Where you go?”), lined with gig posters, private gardens and India’s millennials buying cheap cups of chai and chewing gum before buzzing away on their nippy motorbikes. Delhi was never supposed to be cool. But then neither were Hackney Wick, Forest Gate, Belleville in Paris, or Bushwick, ten years ago the fag end of Brooklyn that nobody ever went to before artisan pizzerias (of Roberta’s) and Lena Dunham (of Girls) turned up in all their glory. 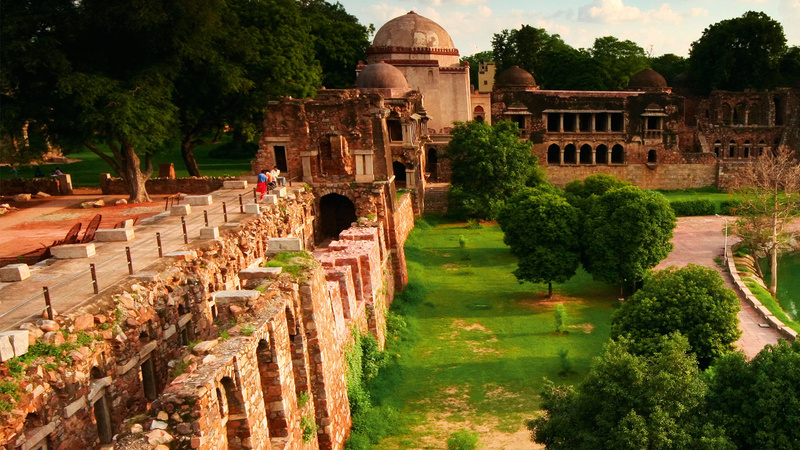 Hauz Khas is still swallowing all its urban sprawl. Despite having been shoved through the gentrification chamber some time ago, it still gives off the air of being a bit dazed at its status of ‘urban village’. The pedestrianised enclave is instantly different from the rest of the city: the crowd is younger, the tenements more polished and the vibe more laid back. Come and hang here, it says – we’ll show you a good time. 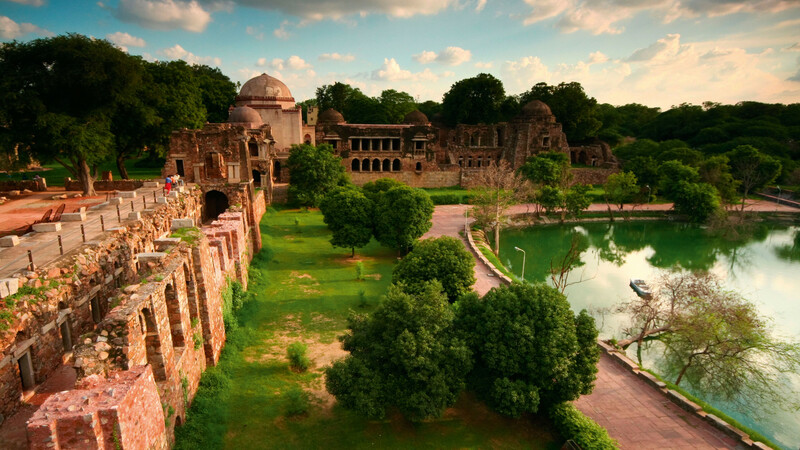 Not that long ago this tiny enclave, sunk into the greenery of surrounding Deer Park, held almost only the Hauz Khas Complex, an ancient mosque and madrasa around a now-luminous green lake. Rather than worshippers, today its stone steps and high walls are filled with high-school kids – some in couples, some in groups, some drinking takeaway coffee from the recently opened Starbucks, that bellwether of gentrification – but all taking selfies. Unsurprising. It’s a beautiful place. Chandni Chowkis an Indian microcosm distilled into a couple of square kilometres. 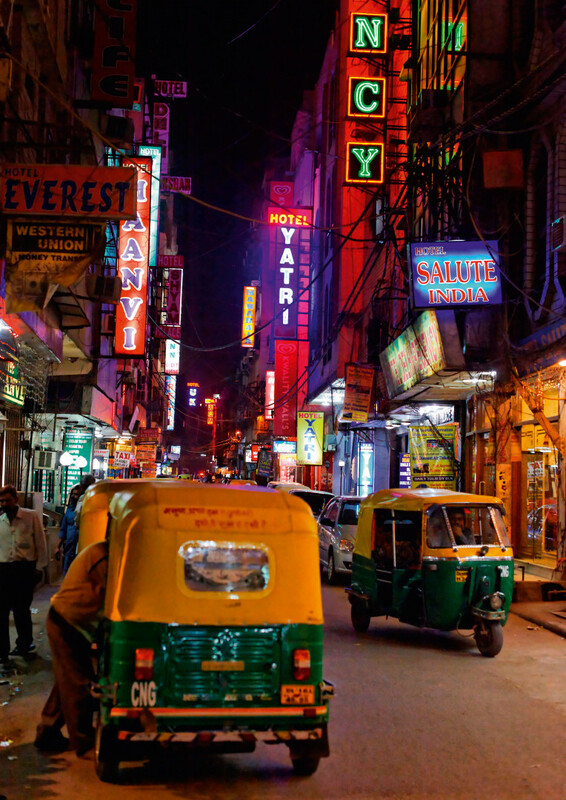 The market – one of India’s largest and busiest – sells everything from live chickens and hot chai to silks and spices. Its small alleyways are choked with rickshaws and hanging wires, but getting lost inside is all part of the fun. The old Mughal residence in thae centre of old Delhi is India’s answer to Buckingham Palace (sort of). Even if you don’t go inside to explore its chambers and rooms, lazing on the grass surrounding it (avoiding a ticking off from the guards) is a relaxing afternoon in itself. No, it just LOOKS like the Taj Mahal. The blockbuster Humayun’s Tomb, the resting place of a Mughal emperor, is surrounded by lush (in summer) or scorched (in winter) gardens. The five-minute stroll from the entrance to the building is an Instagram shot waiting to happen. Otherwise known as the Baha’I House of Worship. The choppy, angular Lotus Temple proves that Delhi doesn’t just do intricate, Lutyens-style architecture. It’s as impressive from the interior as from the exterior – look up at the light-filled, petal-shaped ceilings. The 130-acre presidential complex is the most impressive example of the work of Edwin Lutyens – slated as the architect of modern Delhi. You’d be lying if you said you didn’t want to go home with at least one piece of Indian tat. The place to get it is Dilli Haat, just outside Hauz Khas – where local artisans sell everything from fabric to pretty silver jewellery. Remember to haggle. It’s Friday night at the Summer House Café, Delhi’s version of Frank’s in Peckham. Coloured filament bulbs swing like talismen next to bare brick walls. But rather than the car park beneath, it’s shabby market buildings (including the excellent Middlesex Books – full of Penguin classics for a snip). I’ve been sent here by my friend Sheeba, born and bred in Delhi, but now shacked up in the Himalayas 200 miles away. While at university here a decade ago, the Summer House was her regular hangout – although she claims it was nothing like what it is today. It’s not hard to imagine her here now among the well-dressed Indian millennials – all speaking flawless English, crowding its tables and drinking mocktails (it’s Gandhi’s birthday, so one of a handful of India’s dry days) – queuing up the stairs. They’re probably vying to see another star. Last September, the Summer House was deemed cool enough to host frontman Chris Martin, who played a solo acoustic set on the roof. And into Hauz Khas Village proper. Many of its residents are long-time Delhites who have moved into the village to work, chat and let ideas percolate. And there’s nowhere better to do this than in Social, the joint where Delhi’s hipsters have traded chai for coffee and commotion. Found down a slim back alley and set across three levels, Social does hot-desking by day and cocktails by night, blurring the lines between boardroom and bar. Naked bulbs hang from the ceiling and pipes curl around the walls. It occasionally hosts rotating exhibitions: right now, I’d guess it’s street art, judging from the ‘we should kiss now’ spray painted on the wall by the entrance. I’m told everybody from digital marketing consultants to local start-up entrepreneurs call the Social workspace home. While I’m not tempted to drag my Macbook onto one of the large benches, I do happily curl up on a wrought iron double bed on the rooftop with a flaky dosa to watch the sun set over the lake. To Elma’s at The Living Room (TLR for short), which hosts jobbing singers and musicians throughout the week. They perform among the bric-a-brac: pressed butterflies, a giant grandfather clock and antique wooden furniture. I stopped by for homemade cake (of course there’s cake) and a designer coffee – a good warm-up for a Deconstructed Moscow Mule at Social later. 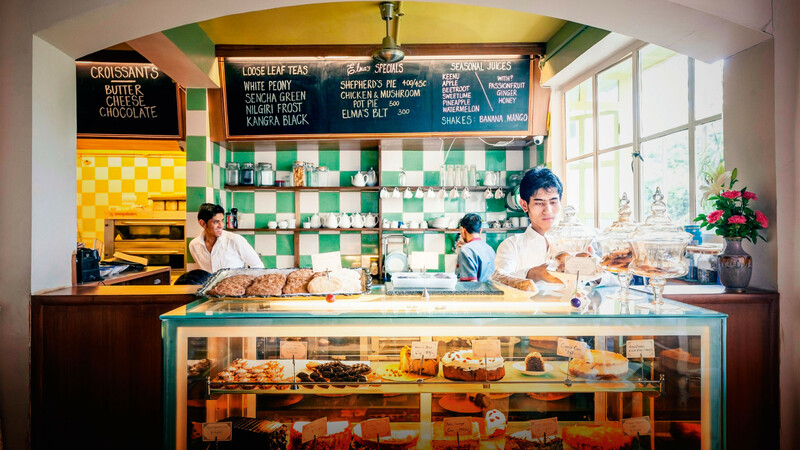 Then there’s whitewashed café Coast, which takes its design cues from the Mediterranean. The best place in Hauz Khas for chilled lunches, Coast serves storming Goan fish curry with fluffy appams, a type of light south Indian pancake. Check out safari-style boutique Ogaan downstairs if you’re headed to the jungle after (I wasn’t). Boutique shops in the village run from the upmarket to the esoteric. From dime-a-dozen curio shops (get your Andy Warhol-patterned coasters and phone cases here) via fabric shops swathed in pretty colours and textures, to the expensive Nappa Dori – home to handcrafted leather bags, luggage and accessories – and Pjjama Party. The latter, as its name suggests, does a decent line in playful loose-cotton trousers. Then there’s Art Konsult, which specialises in contemporary Indian art and hosts a handful of exhibitions each year, and Dag Modern, with branches in Mumbai and New York, which does much the same. The urban village isn’t just germinating in Hauz Khas. 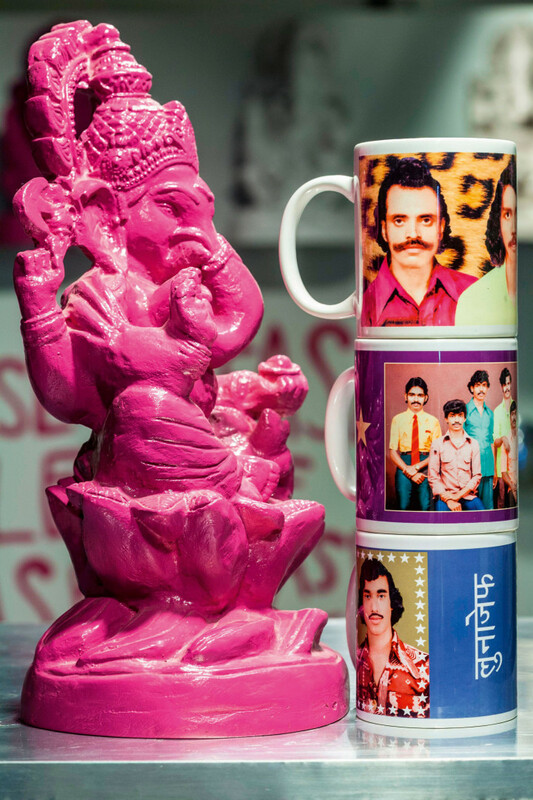 Thanks to exceptionally cheap rents, nearby Sharpur Jat is home to a cluster of start-up design boutiques hidden among its dusty dosa shops, buildings in a range of bright birthday cake shades and women’s tailors – originally what flourished in the area. Check out Jungi House, a strip of concept stores and cool cafes, including the geeky Café Red, which projects music videos onto a spare white wall otherwise covered in pencil drawings. 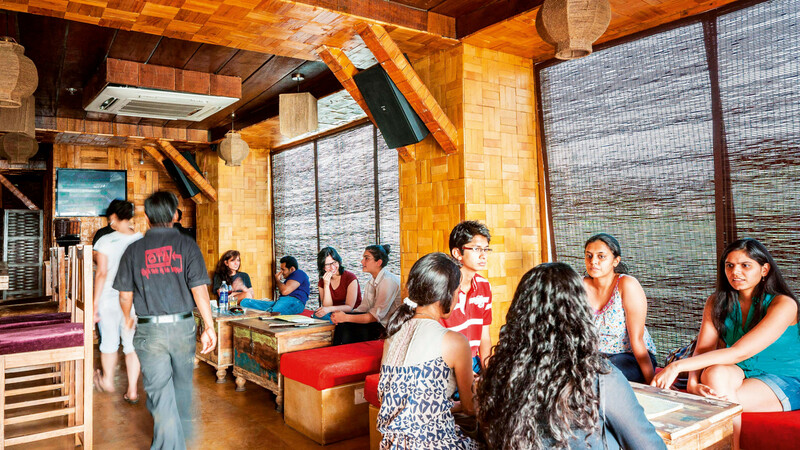 Is Hauz Khas headed the same way as Williamsburg and Hoxton? Its critics call it an over-consumed village divorced from the rest of Delhi. Its champions call it the best night out in the city. Both are right.